Desautels Faculty of Management super-volunteer Donald Lewtas was presented with the McGill Alumni Association’s (MAA) Award of Merit at this year’s edition of the MAA’s annual Honours and Awards banquet. The Toronto-based business leader was presented with the MAA’s top honour by Principal and Vice-Chancellor Suzanne Fortier. Lewtas was recognized for his long-standing dedication to the Faculty, most recently as Co-Chair of the MBA Next 50 Campaign supporting the expansion of the Faculty into the new Donald E. Armstrong Building, and as Chair of the Council of Faculty Advisory Board Chairs. 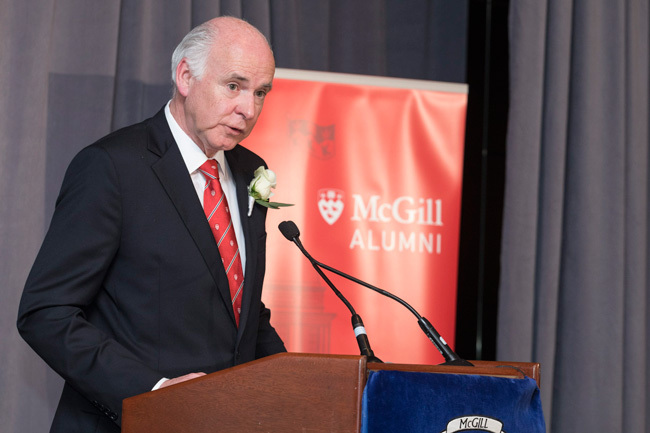 More than 300 guests, including McGill Chancellor Michael Meighen, attended the annual banquet, a highlight of the MAA’s calendar, recognizing the outstanding achievements of students, faculty, staff, alumni and friends of the University. This year’s event, which took place on April 18 at the Omni Mont-Royal Hotel in Montreal, showcased the achievements of 16 honorees including Distinguished Service Award recipients, Jonathan Birks, BA’67, and Harriet Stairs, BA’67, and D. Lorne Gales Special Recognition Award winner, Nova Scotia’s Sherrill Rand Harrison, BA’62. Sherif Emil, MDCM’91, was recognized for his volunteer missions to Africa as well as his leadership in Faculty of Medicine class fundraising. Jennifer Fraser, BSc’90 and Fiona Kenyon, BA’02, of the McGill Alumni Association of Zurich won the Alumni Event of the Year Award for their Canada 150th anniversary mega-celebration, which attracted over 250 guests and even garnered the attention of CBC Radio. Henry Hing-Yip Tsang, BSc(Arch)’00, MArch’02, returned to campus from South Korea to receive the Robert Fung International Award of Distinction, while the Washington, D.C.-based co-Presidents of the MAA branch, Nickolas Cieslinski, BA’08 and Sarah Babbage, BA’10, received the Catherine Nance Common President of the Year Award. Closer to home, classmates from the BSc(Agriculture) and BSc(Home Economics) Class of 1968 attended in force to receive the Charles H. Peters Alumni Group of the Year Award. McGill’s provocative management icon Henry Mintzberg, BEng’61, received a standing ovation while receiving the David Johnston Faculty & Staff Award for his enduring role enhancing the reputation of McGill around the world. Redmen lacrosse coach Timothy Murdoch took home the Honora Shaughnessy McGill Ambassador Award for his dedication to the sport, team building and tireless recruitment efforts. Notable for his work in philanthropy, Howard Davidson received the Honorary Life Membership Award, given to a non-graduate. The most poignant moment of the evening was reserved for Ai Thien Tran, BSW’09, who received the James G. Wright Award for making a difference in his community. A native of Vietnam, Tran fled his home country by boat and lived as a stateless refugee in the Philippines for 12 years before being able to immigrate to Canada and eventually graduating from McGill. Tran has since dedicated himself to helping others and working with Vietnamese community members. He became the first Canadian of Vietnamese origin to win the Top 25 Immigrants Award in 2012 and is now a social worker with the Government of Alberta. The Honours and Awards Class of 2018 also includes three students: Adamo Donovan, BSc’16, PhD (in progress), Shawn Errunza, BEng’10, MDCM (in progress) and Alexander Lachapelle, MDCM (in progress) who each received a Gretta Chambers Student Leadership Award for their contributions to the university and the community. Selected by the MAA Honours and Awards Committee, these award-winning volunteers lead McGill’s international network of alumni branches, make a difference in communities on campus and around the world, and contribute to McGill through dedicated service to the University.